In the Mississippi river we have Carp, Walleye, Catfish, Bluegill, and more. You wouldn’t expect to see a fish averaging five foot, 130 lb. in those waters but that is what exactly the Paddlefish i s. The Paddlefish, being one the largest fish in our freshwater system, when full grown the Paddlefish has almost no predators, I say almost because there are always humans. Yes, humans. Paddlefish are rather large and contain succulent, white meat which is great source of protein. Their skin is tough and durable making that desirable as well. That’s not all they are used for either. Paddlefish produce caviar which is a delicacy known worldwide. Humans are not the only organisms that think the Paddlefish is delectable. The Silver Lamprey is one of the parasites that feed off the Paddlefish. The Lamprey has sharp, hooked teeth that they use to dig into the Paddlefish and feed. 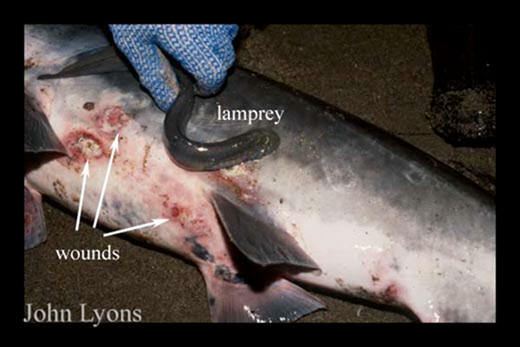 Although the Lamprey usually does little to affect the life of a Paddlefish, the Lamprey does leave some pretty nasty scars as shown in the figure above.